In a past post, I mentioned I was taking a few days off, and I was heading up to San Francisco. The situation came up that I was able to leave Monday night. 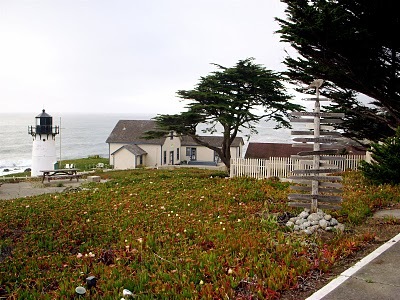 I thought I would stay at the Montara Lighthouse Hostel, which is 25 miles south of San Francisco. 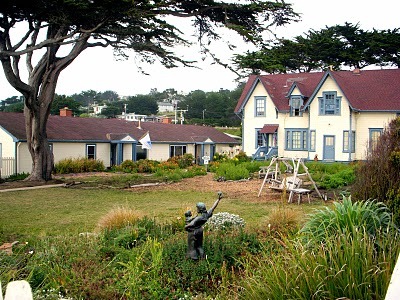 From the pictures you can see that this hostel is set in a beautiful area on the cliffs of the Pacific ocean. I give this Hostel two thumbs up. The outside setting is stunning. Right on the cliffs with the waves smashing into the rocks below. 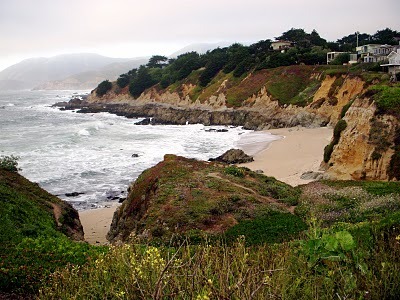 Just down the hill, from the below photo, their is easy access to the beautiful beach with high cliffs to the north. For twenty to twenty five dollars a night, a person can’t beat it. Within the Hostel, their are two spacious super clean kitchens, with at least four refrigerators for your own food. The dining area is also a spotless large area. The common area is very comfortable with cushy lounging furniture. The room I slept in had three bunks that sleeps six people. There are also push button locks on each dorm door. They also have small lockers that can hold any valuables. Super nice friendly staff which greets you when you walk in. They supply the sheets and towels. With so many positive qualities, there must be some one or two not so positive. Within the main building there are only two bathrooms. Although, what needs to be considered, is that most people, for some reason or another, get up around nine or ten in the morning from my observation-I am referring to the morning rush. Considering this, the bathrooms are in high demand during this time. I personally get up early before anyone else and hit the shower to avoid the rush. There are always some people that complain. They are not making anything better for themselves complaining. Don’t forget; the Israelites complained to Moses; they did not benefit from it. Consequently, from my observation, people that complain receive their karma; instantly, by their misery, and life just not going correctly for them. Moses tried to warn people. The only comical, less then positive quality, the beds squeak. It’s just the way it goes, each hostel is different. I look at the humor behind it. Turning in the middle of the night might wake up the roosters. I found if kind of funny, although this hostel is on the top of many I have stayed in. The outdoors, friendly staff, cleanliness, the quietness, outweigh a minor squeaky bed. Previous post: The Gift of Talent.